The following post is sponsored by MyRaceRagz. 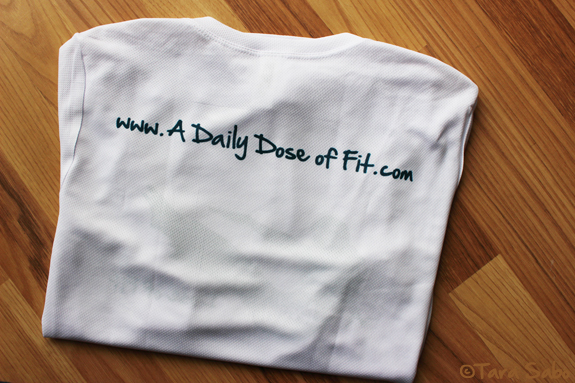 No compensation was provided, but they did send me a custom race tee to review. All opinions are my own. And there's a giveaway at the end! I've been reading (and loving) a lot of winter race recaps lately. Right now, my running game is somewhat limited as I am 21 weeks along with baby #2. I'm still comfortable when I run, but I couldn't possibly add any race training to my schedule since I am already teaching group fitness four times a week. That would just be too much for this momma. So I'm keeping it to 3-milers at least twice a week, usually on Thursday and Saturday mornings. MyRaceRagz reached out to me a few weeks ago and offered up the chance to review their service. They're an awesome company, really. And I totally dig the concept of customized race shirts. I got a few made through a local service last summer when a group of us ran the Indianapolis Women's Half Marathon, and even though that company was right down the road, it was a difficult process and the customization definitely added up, too. Had I known about MyRaceRags, that's probably the direction I would have gone. You're not limited to text only. You're not limited to certain colors. You can basically do what you want, as long as you're okay with a white tech tee...but that tech tee can be long- or short-sleeved, even sleeveless. Yes, they all wick moisture away which we all know is key. And you can very easily print on both sides. I don't dare stretch it out. But I can tell it's going to fit perfectly when I'm without bump. But if you're with bump and you order a shirt, I would definitely go up a size just to be safe. 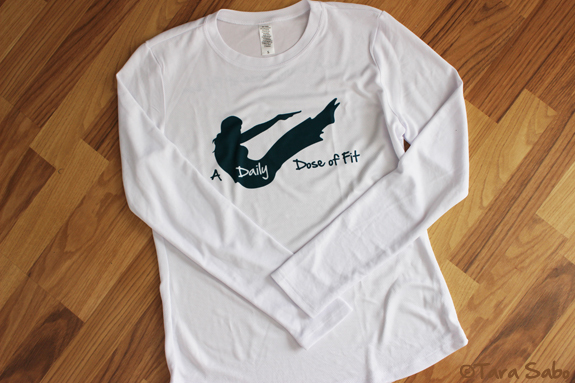 • Custom shirts range from $31-$40. • Free shipping after you spend $50. • 10% discount on ten or more items. 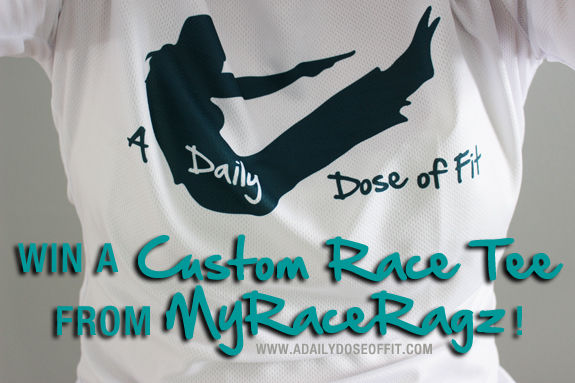 MyRaceRagz is giving one lucky Daily Dose reader the chance to customize their own race tee. Literally, you can do whatever you want with it! Use the Rafflecopter widget below to enter. I'll pick a winner after Midnight EST on Friday, January 31, 2014. Unfortunately, you must be a resident of the USA to enter, per MyRaceRagz. Good luck! I'm really looking forward to the Cincinnati Flying Pig Marathon. It will be my first marathon. I'm nervous and it's still four months away! I've heard such great things about Flying Pig. So excited for you to complete your first marathon! I just can't imagine... Hope the training is going well! That would be the biggest hurdle for me. Bloomsday in May! This year my hubby and I will be walking with our baby...due any day now! That would be really neat to win! My sister got my entire family custom tee shirts one year to support me in a triathlon. They said "Go, Mandy, Go!". It was very sweet. I love tech tees! Hope you can get back into it! Do what feels right! Hope your pregnancy is going well!